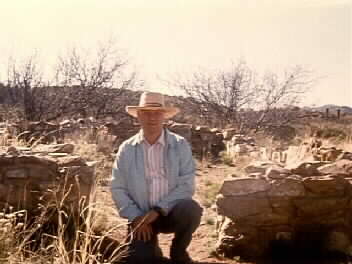 These are the remains of the Butterfield Stage Station at Apache Pass, first set up by James Tevis about 1853. Later, Ft. Bowie was placed near by, partly in order to protect the station. The station was the site of many historical episodes. I was very surprised to see it still there. Even the old stage coach road can still be seen! That's me with the hat!